School days are an important part of student’s educational life at any level , as these activities away from the routine of school work make them happy and make their learning more fruitful. 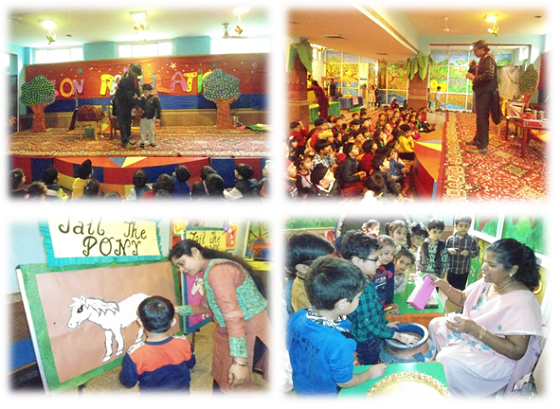 Keeping the above thought in mind , K. R. Mangalam World School Paschim Vihar organized a Fun-Day on 5 November 2015 for all the kids to mark the most auspicious days i.e. Diwali festival and Children’s Day. Also to enforce them with the rich Indian culture and heritage as well as make their childhood most memorable through such enthusiastic events. As both the events give immense joy to our kids, the ‘Fun Day’ truly justified the occasion. The entire school was decorated with various beautiful items wall hangings like Diyas Lantern , Bandhanwar etc. The school was converted into a field of fun-filled ground. The classrooms basement and playground had become the venues of different game stalls like – Hit and Win , Lucky Dip, Super Sixes, a ‘Statue Dance’ game and musical chairs etc. The children flocked incessantly to the game section to try their luck and displayed their skills at various stalls. The most awaited event was the Magic show which added a spark to the day. Children were enthralled to see various presentations and mystifying illusion through the art of magic which truly fascinated little Mangalities. Towards the end of day one could see the sparks of joy in their little eyes and a pride for winning the game. It was truly a fun-filled day to be cherished for a long time.